Apple Mighty Mouse - Wireless (Bluetooth) Model No.A1197 (obsolete). Release date: August 2, 2005. Discontinued: October 20, 2009 (Wireless). Support Methods Driver/software is automatically identified as the mouse device is detected. Pricing Scheme N/A (obsolete device), but can be bought as secondhand - for example, on Amazon. The Mighty Mouse is made of white plastic and has a recessed Apple logo on the mouse's face. The mouse has four functional "buttons": a left capacitive sensor, a right capacitive sensor, a track ball with a pressure sensor and side squeeze sensors. The track ball enables users to scroll a page or document in any direction, including diagonally. Two of the above-mentioned inputs are not physical buttons. 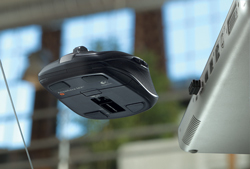 Rather, the touch-sensitive topshell (mentioned below) and the pressure sensing trackball allow the mouse to detect which side is being touched or whether the trackball is being held in. Currently, Mac OS X is the only operating system that fully supports the mouse without third party software. When used with Mac OS X, the sensors can be set to launch applications or trigger features of the Apple operating system, such as Dashboard and Exposé. If not used with Mac OS X, the mouse behaves as a four "button" mouse with a vertical and horizontal scroll wheel. There are third-party drivers (XMouse, AppleM) that provide more functions to users of other platforms such as Windows. The Mighty Mouse does not report whether the right and left sensors are activated simultaneously. In fact, it reports a right-click only when there is no finger contact on the left side of the mouse. Thus a right-click requires lifting the finger off the mouse, then right-clicking. This also means that the Mighty Mouse cannot support mouse chording, used by CAD software, games, and other applications where multiple functions are mapped to the mouse. I got hold of this mouse because a neighbour of mine was throwing out some stuff, and I offered to take it to the local Mission Charity shop - I regularly take all sorts of discarded but still useful stuff there (typically a car trunkfull a week), and they sell it in their various outlet stores. The mouse was now operational, and I began to use it to see what it was like. (a) I don't usually like to use a mouse as it aggravates an old carpal tunnel injury (RSI). I prefer to use a touchpad and the keyboard a lot, as a mouse is just too tediously slow for my liking anyway. (b) I have studied and applied ergonomic design principles in time and motion studies and computer interface design, and having had problems with my back since teenage years, and learning to safely weight-train despite that, I am now automatically acutely aware of good and bad ergonomics in anything to do with human movement, man-machine interfaces and printed and audio-video media. So what was the mouse like to use? I thought it a superb example of intelligent ergonomic design. Very nice to use. Repeated from above: There are third-party drivers (XMouse, AppleM) that provide more functions to users of other platforms such as Windows. Programmable functions for the four "buttons"
People who might need or like to have an improved ergonomic interface with their computer. Seems like a very good, well-designed and well-manufactured product. Although the Mighty Mouse can sense both right and left clicks, it is not possible to press both sensors simultaneously. The user must learn to lift the left finger off the sensor surface before attempting a right-mouse click. The scroll ball will eventually become clogged with dust and require cleaning. While there are methods to clean the ball without dismantling the mouse some users have complained that the Mighty Mouse is difficult to clean because the scroll ball mechanism is hard to take apart. If you use a mouse a lot, this mouse could well make your computer use easier/more comfortable. Since I don't really like using a mouse, I did not try this one out for very long. I reckon that, despite it's design age (2005), it could still be ahead of many current mouse designs, and the cost would be low (you should be able to pick it up for a song). @mouser: I tried one of these mice once, and was driven crazy by the lack of good tactile feedback on the left and right mouse buttons. @lanux128: as interesting as this review is, i prefer Logitech mice which comes in all shapes and sizes with superior (imo) ergonomic features. I really like this mouse, but would not be likely to use it much for myself. I would like to see if my daughter could take advantage of it instead of her Logitech wireless mouse (which is an excellent mouse), but unfortunately she has no Bluetooth functionality on her laptop. So I will probably not keep the mouse. In light of @lanux128's comment, I might post a review of my daughter's Logitech M515 ("Couch") Mouse. Just the Wikipedia link above, though a DuckDuckGo search turns up a lot of references to this mouse. I tried one of these mice once, and was driven crazy by the lack of good tactile feedback on the left and right mouse buttons. as interesting as this review is, i prefer Logitech mice which comes in all shapes and sizes with superior (imo) ergonomic features. plus the Logitech wireless mice have excellent battery life... like a year in my case. 2013-08-29: I just updated the OP mini-review with some of the comments above. I too think the Logitech mice are superb. I shall probably do a review of the Logitech M515 ("Couch") Mouse that my daughter uses. the M515 Couch mouse is an excellent mouse. my wife has been using it for about a year now and still yet to replace the batteries. if i have to upgrade, it would be for a mouse that works on glass surface, like the ones with the new "Darkfield" technology. In the ~15 years I've been in IT, I've only run across that scenario once ... And when I finally (noticed the red dot on my shoe...) figured out what was happening damn did I feel like an idiot. Got to thinking about it and there is something worse than a laser mouse on glass. A few years ago (okay several) when laser mice were just gaining popularity. Dell started using a holographic logo on the mouse pads that they included with their new computers. One of our clients still has these infernal pads in their exam rooms and I have to toss the things in a corner every time I'm there to get control of the mouse...or deal with it spastically ricocheting all over the screen. I actually like the plain old $12 MS optical wheel mice. I used to swear by Logitech mice. As soon as I went cordless that mostly changed to swearing at them. I routinely had problems - mostly getting left clicks to register. Partly that may have been due to the significant EMI problems on one side of the house. It affected everything from FM radio and TV reception to cordless and mobile phones to wireless ethernet. OTOH Microsoft cordless mice were rock solid in the same environment and it seems odd that the right button on my Logitech mice would work flawlessly even when the left button didn't. That reminds me of my idiot moment (okay it was a couple hours) when I tried using my first optical mouse on a glossy black and green book cover. thanks for the imagery.. i hadn't thought of that situation.. Page created in 0.03 seconds with 41 queries.